Americans expect their banking provider to actively help them make better financial decisions, but most institutions are falling way short. For starters, only one in four Americans say they understand the basic suite of products and services their bank or credit union offers. And it's not for lack of interest. Four out of five consumers say their financial institution should be sending them more information than they are currently receiving. 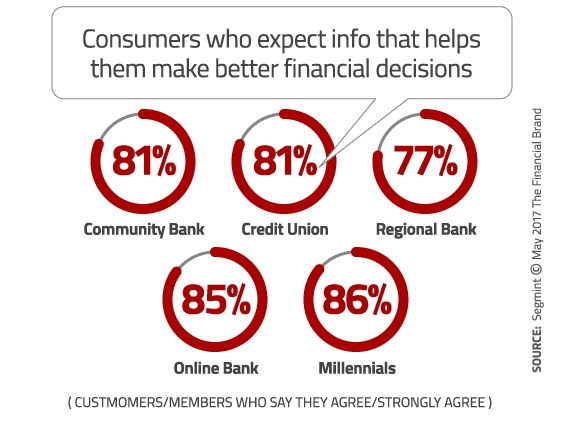 Out of 2,000 U.S. adults who participated in the 2017 Segmint Consumer Bank Marketing Study, 80% of those surveyed think their bank should be providing them with information tailored to their needs and circumstances that will help make better financial decisions. However, barely a quarter (28%) feel their banking provider actually delivers information that helps them reach their personal financial goals and life events such as paying for college or saving for a down payment on a home. More than half of consumers (52%) said they would rather have their bank proactively share information and offers relevant to their needs than research products on their own. That number jumps way up to 62% among Millennials. The findings suggest that financial marketers need to radically accelerate their content marketing efforts. 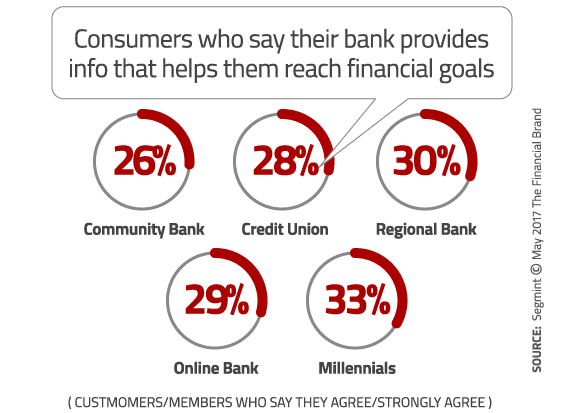 People are saying they are hungry for more insights and information from their primary financial institution, so banks and credit unions should feel obligated to respond with a broad range of content — from money-management tips shared in social channels and blog posts exploring more complex financial matters, to educational seminars and webinars. You don’t worry about over-sharing. 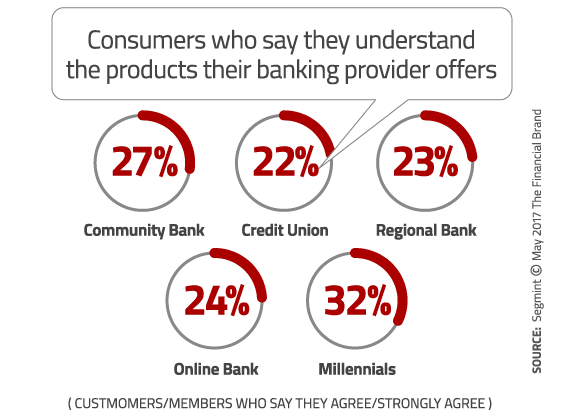 Only one in ten consumers feel they receive too much communication from their bank or credit union trying to cross-sell them different products and services. Nevertheless, there are some insights to be gleaned from those who complain about the material financial marketers are sending them. Among the 11% of consumers who say they receive too much marketing, the table below breaks down the reasons they aren’t responding positively to cross-sell communications. The good news is that banks and credit unions can overcome many of these objections. There are a multitude of ways financial marketers can figure out what products a consumer does and doesn’t likely need — data analytics, life stage mapping, predictive analytics/AI, behavioral analysis, and simply by asking them. That’s the first step. After all, you need to know what someone needs (or doesn’t need) before you can sell them anything. The goal is to contextualize and personalize your marketing messages as much as possible to create maximum relevance. This requires that you (1) know as much as possible about the audience, so you can (2) segment the audience and target your communications accordingly. More than a quarter of consumers (28%) say they never see online advertisements from their bank or credit union beyond the institution’s website or mobile app. This is a problem that is ridiculously easy for financial marketers to solve. With mainstream retargeting solutions from the likes of Google and AdRoll readily available today, there is no excuse — cross-selling via digital channels should be a major component in every financial institution’s marketing plan. According to Segmint, the marketing models used by many financial institutions today are outmoded, something that their research seems to support. Segmint says it takes too much time for marketers to collect data, analyze it, build a strategy and then ultimately launch their campaigns. Instead banks and credit unions must find ways to individually tailor mass communications at scale, and compresses the timeline down from months to a matter of minutes. This article was originally published on May 16, 2017 . All content © 2019 by The Financial Brand and may not be reproduced by any means without permission.